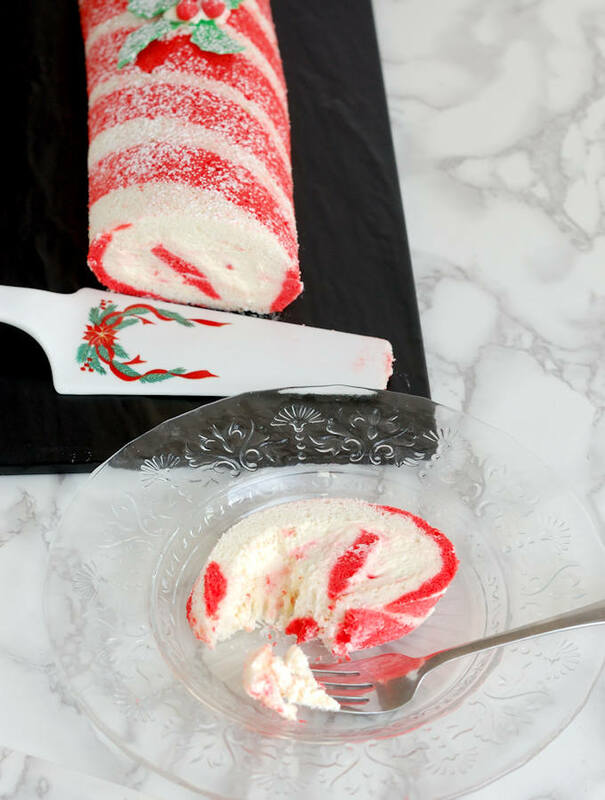 Peppermint Roulade is a cake that thinks it’s a candy cane. 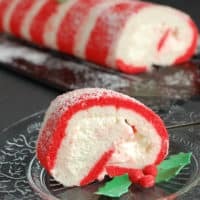 A red & white striped sponge-cake-roll is filled with white chocolate-peppermint cream and chunks of crushed candy canes. 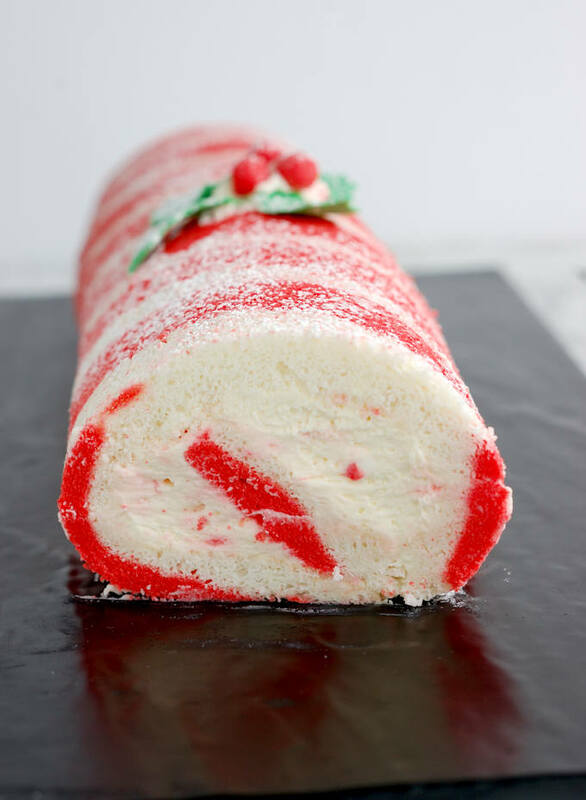 Even though I love my new Peppermint Roulade recipe, I’m completely sick of this cake right now. Don’t worry, it’s a really good cake. I know, because I had to make it 4 times to get it exactly right. That’s why I’m so tired of this cake! 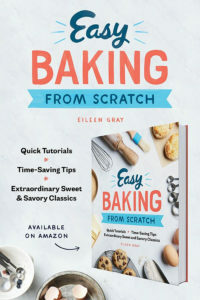 I’m sick and tired of baking it! So why did I make this cake so many times? As I’ve said before, there are times I have a recipe in my head and, miraculously, the first time I make it it comes out exactly has I’d imagined. That’s what happened with my Creme Brulee Shortbread and French Onion Tarte Tatin recipes. Going into it, I figured the main challenge was to find the easiest way to do the red stripes. I wanted to avoid piping alternate lines of red & white batter. For cake #1 I piped the red stripes then put the sheet pan into the freezer. Once the red batter was set, I spread the white batter over the top. It worked pretty well. I was awfully proud of myself for getting the stripes right on the first try. I tasted the cake and it seemed a little dry, but I figured once it was filled it would be fine. Now that I had the process figured out, it was time to bake cake #2 and get the photos and video done. I baked and filled the cake, took photos, then took a bite. Hmmm, I tried to convince myself that it was good enough, but, honestly, the cake was rubbery. I put it in the refrigerator overnight, hoping that the filling would absorb into the cake and soften it. It didn’t. Arg, I was focused on how to make the stripe pattern, but the problem turned out to be the texture of the cake. Once again we have to turn to what we learned in the Science of Cake Batter Series to fix a cake recipe. Quick overview: a cake batter has structure builders (flour & eggs) and tenderizers (sugar & fat). 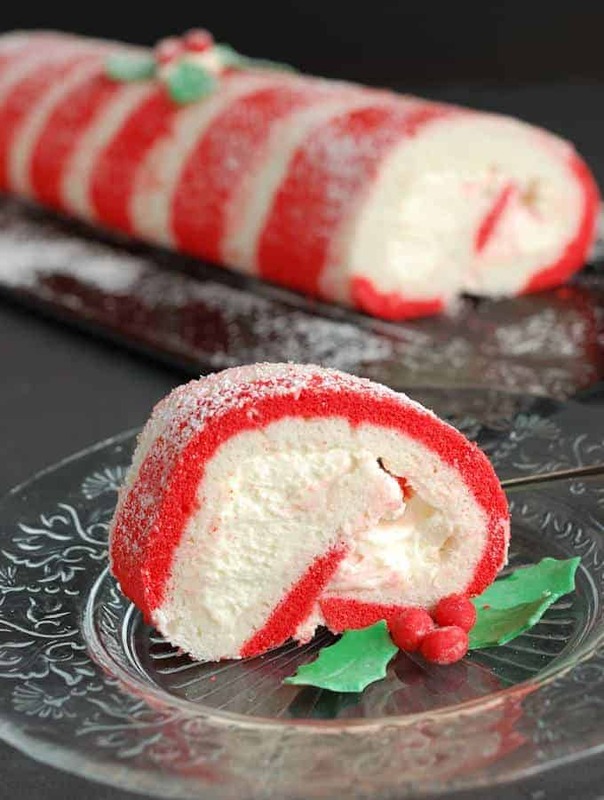 The cake roll was rubbery, meaning it had too much structure. To fix it I needed to up the tenderizers and reduce the structure builders. 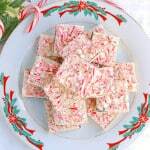 I created the original recipe with no egg yolks so that the white part of the “candy cane” would be really white. I had some butter in the recipe, but without any egg yolks there was just not enough fat to make a tender cake. I reduced the egg whites by one and added just a little sour cream to the recipe. Sour cream not only has fat, it’s acidic. Acidic ingredients also tenderize a cake. Finally, a little water added to the egg whites would make sure the batter was nice and moist so that it could roll without cracking. I thought I had a good, balanced cake formula and proceeded to bake cake #3. I put it in the oven and was surprised when, after less than ten minutes, I could smell that the cake was baking too fast. You know that “it’s going to burn any minute” smell? I took the cake out of the oven and flipped it over, the bottom was totally gummy. 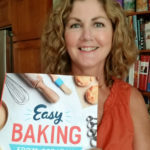 How did I get the recipe so wrong? As I sat there trying to figure out what happened I noticed that I’d set my oven to “convection broil” not “convection bake”. No wonder the cake got too brown on top and didn’t bake at the bottom. There was nothing wrong with the recipe, just with my eyes! Gah, time to bake cake #4. This time I put on my glasses and set the oven to “convection bake”, remade the batter and it baked up beautifully. So, as you can see, 30 years as a pastry chef does not make me immune to totally screwing up in the kitchen. Sadly, I do it all the time. 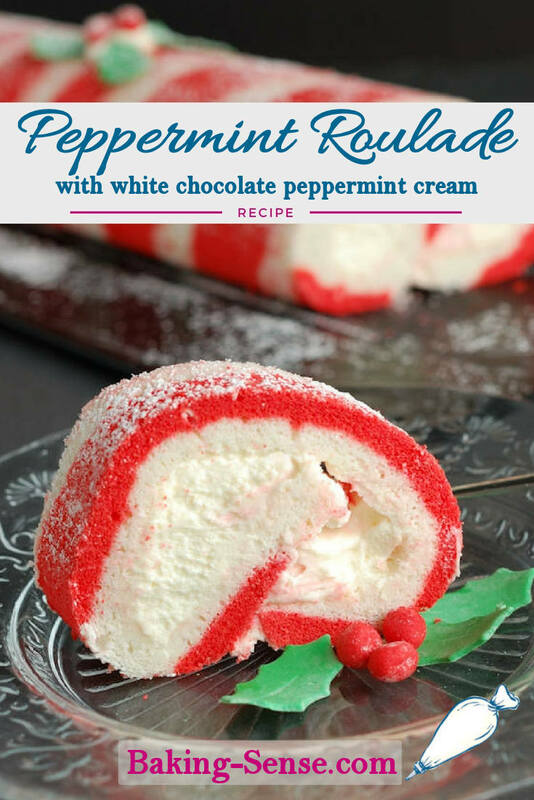 Watch the recipe video to see how to make a Peppermint Roulade (cake roll). 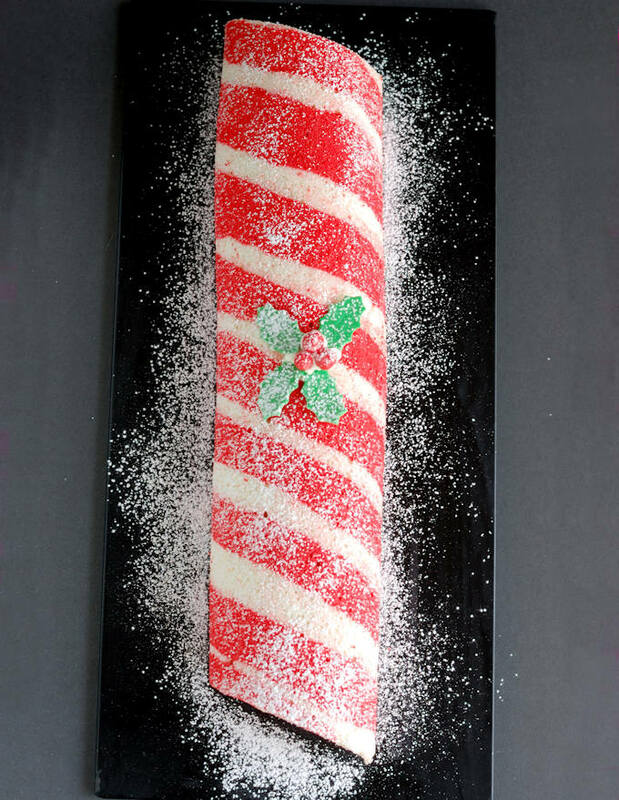 A cake that thinks it's a candy cane. 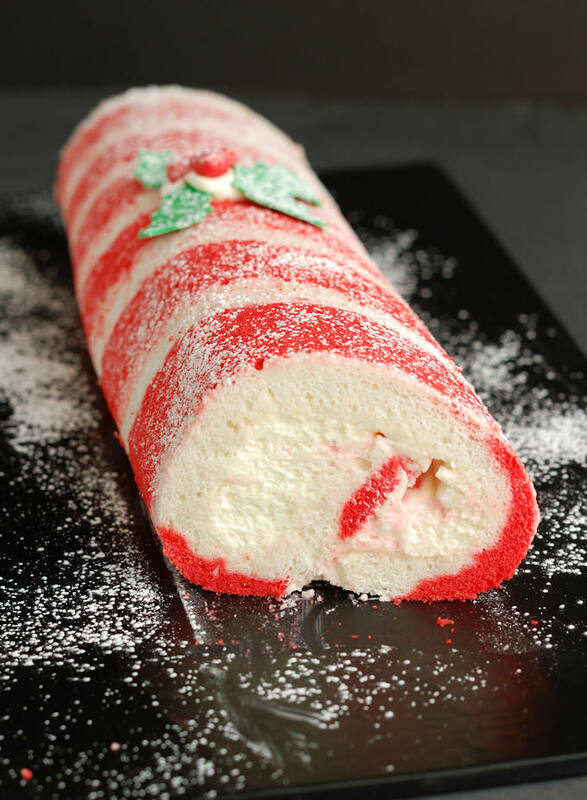 A red & white striped cake roll is filled with white chocolate-peppermint cream and chunks of crushed candy canes. Place a 1/2 sheet pan in the freezer while you make the batter. Preheat the oven to 325°F convection or 350°F regular. Combine the melted butter, sour cream & vanilla in a mixing bowl, set aside. In another bowl, whisk the salt into the flour, set aside. Whip the whites to soft peak. Slowly add the sugar and whip to full peak. With the mixer running on low, add the water and re-whip to full peak. Whisk a cup of the egg whites into the butter/sour cream mixture, then whisk that back into the egg whites. Sift the flour over the egg whites and fold into the whites. Remove 1/2 cup of the batter to a separate bowl. Add several drops of the red gel color to the 1/2 cup of batter to make a bright red color. Stir about 1/3 of the remaining white batter into the red base. Put the red batter into a large piping bag fitted with a plain tip or a disposable piping bag. Remove the cold pan from the freezer and line with a sheet of parchment paper. Pipe diagonal lines of red batter evenly spaced in the pan. Set the pan into the freezer for 10-15 minutes until the surface of the batter is firm. Pour the white batter over the stripes and use an offset spatula to spread to an even layer. Tap the pan on the counter a couple of times to settle the batter. Bake the cake about 15 minutes until the center of the cake springs back when pressed. Let the cake cool 5 minutes in the pan then flip out onto a clean sheet of parchment paper. Peel the parchment from the bottom of the cake then flip the cake back over. 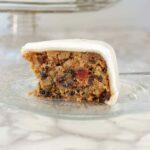 Roll the cake in the parchment and let it cool while you prepare the filling. Whip the cream with the sugar to soft peak. Whisk a cup of the cream into the melted white chocolate to temper. Whisk the tempered chocolate back into the cream. 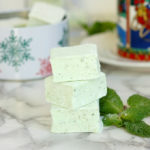 Add the peppermint extract and whip to full peak. Unroll the cake and spread the cream over the cake. 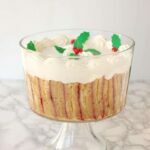 Sprinkle crushed candy-canes over the cream. Roll the cake from the long side, and flip it so the seam is on the bottom. Cover with plastic wrap and refrigerate overnight or for at least 4-5 hours. 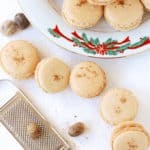 Before serving, trim either end for a clean cut, dust with a little powdered sugar and decorate with optional holly leaves & berries made from fondant or marzipan. Because this batter is fairly soft, it's easiest to pipe the batter with a disposable piping bag. Fill the piping bag before cutting off the tip to avoid having the batter drip out of the tip. 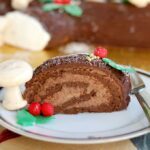 Can you use a standard Jelly Roll Pan 10X15 to make this cake in? I don’t own a half sheet pan and it wouldn’t fit into my small oven is why I asked would love to make this today for a Christmas get together tomorrow. If so would you use the same amount of cake mix? ?